Oddsmonkey has an awesome piece of matched betting software on their premium service called the each way matcher. This software behaves in a similar way to the Oddsmatcher but it scans the bookmakers’ websites for the best odds on each way bets and compares these against the exchanges’ websites for the best lay odds. It then ranks the matches in order of what will return the most profit. In this guide I’ll show you how to make profit from each way arbing! 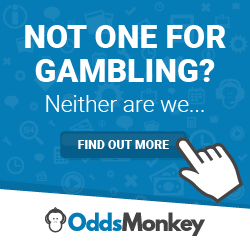 When you sign up to Oddsmonkey premium membership, you will receive a call with one of their staff and I took this opportunity to learn a new skill on their website. I spoke with Russell on the call who works at Oddsmonkey and he showed me how the each way matcher works and how to make money from it. As soon as I got off the call, I put what he showed me into action and I made £22.00 almost instantly from the each way matcher. I was blown away and thought this was a very clever way to make money from each way betting. Each way betting involves placing two bets; a bet on a selection to win the event outright and also for the selection to finish in the top few selections for a lesser fraction of the outright odds. This may sound complicated at first but in reality it is very simple and easy once you learn the numbers involved. In the red section of this image that I have highlighted you will see “3 places ¼ odds” and “Each Way” with a little box next to it. This is where you would normally find the option to place a bet each way. The normal back odds of this horse are 13.00 (12/1). If I decide to stake £10.00 on this horse to win normally, I would expect to win £130.00 if the horse wins the race. Each way betting is slightly different. I have now entered a stake of £10.00 on this horse to win the race and also clicked the small box next to “Each Way” as you can see above. This actually doubles my initial stake of £10.00 to £20.00. This is because an each way bet is essentially two bets; one bet for the selection to win the event and one bet for the selection to finish in the top few (in this example, in the top 3 as it says 3 places). Of course the odds to win outright are 13.00 but the each way odds are a fraction of these odds, in this example they are ¼ odds so this is how we work out the each way odds. We take the true odds at 13.00 and subtract 1. We then get 12.00. The each way odds are ¼ of the true odds in this example, so we then need to divide the true odds by this fraction. So 12.00/4 = 3.00. We then simply add 1 to this number and we end up with 4. This keeps the each way odds in decimal format to make calculations easy to work out. So the each way betting odds in this example are 4.00. The permutations of what could happen regarding my payout from this bet are listed below. If the horse wins, I will win £130.00 from the outright bet (£10 stake multiplied by 13.00). I will also win from the each way bet (as it has finished in the top 3). This will be an extra £40.00 (£10 stake multiplied by the each way odds of 4.0) so altogether I will win £170.00 if the horse wins. If the horse finishes second or third, I will win the each way bet and walk away with £40.00 (£10 stake multiplied by 4.00 each way odds). If the horse finishes fourth or lower, I will lose £20.00 (as both the outright bet and each way bet have lost). The each way matcher works to find us the most profitable each way arbs currently on the market. Again this saves so much time when looking to place each way bets as it does the hard work for us. So right now we can see a horse called “NEVER A WORD” which is the most profitable bet to place on this matched betting software. If we click “Open Calculator” we will see how the money is made when it comes to each way arbing. This is what the calculator looks like on the each way matcher. This can look complicated at first glance but it is actually very useful and it isn’t as scary as it looks. The green number of £12.34 in the top right is the amount of money we can expect to make from doing the bet as it is. So this involves 3 very simple steps. Login to the Stan James account and deposit £50. Then find “NEVER A WORD” in the 19:10 Kempton race and bet £25 each way (£50 in total) at odds of 34.00. Login to your Smarkets account and enter a lay stake of 28.32 at odds of 30.03. You will need to ensure you have a liability in Smarkets of £822.13 to cover the lay bet. You will then need to bet the place lay bet on Smarkets. The place market on Smarkets is usually just below the outright market. This is a lay stake of £35.14 at odds of 6.60. This will require a liability of £196.78. Your lay bets in Smarkets should look like these below. So altogether we have used £1,068.91 to make £12.34 which isn’t the best each way arb to do but there are much better opportunities to take advantage of throughout the day. You will find ones where the odds are lower which require you to use less money and your profit will be higher. Either way I am sure you can agree that though this may not return the most amount of money, it is still a much better return on your money than you will get in a savings account nowadays. Another way of doing each way bets is for extra place races where you win at the exchange and the bookie for finishing in an extra place. These are the permutations now for this example. We will win £850 (£25 stake multiplied by 34.00 odds to win outright) plus the each way bet. The each way odds will be 9.25 (34.00 – 1 = 33.00, 33.00 divided by 4 33/4 = 8.25, 8.25+1 = 9.25) so £25 multiplied by 9.25 will return £231.25 as well. So in Stan James we will have £1081.25. Then minus our liabilities in Smarkets, we will lose £196.78 and £822.13. So £1081.25 minus £196.78 and minus £822.13, this gives £62.34. Then minus our back bet at Stan James of £50.00, this leaves us with a profit of £12.34. We will win £231.25 at Stan James (each way odds of 9.25 multiplied by £25 stake). We will then win our lay bet at Smarkets for the outright, so this would be £28.32 multiplied by 98% which gives us £27.75. We will then lose our place liability of £196.78 on Smarkets as well as our £25 back stake on Stan James. So altogether we will win £231.25 + £27.75 = £259.00 then minus our liability of £196.78, this gives us £62.22. Finally, deduct our £50 stake at Stan James and we are left with a profit of £12.22. We will lose both our bets at Stan James. This means both our lay bets at Smarkets will win. Our lay stake of £28.32 to win will give us £27.75 (£28.32*0.98). We will then retain 98% of our lay stake from the place bet of £35.135. This will give us £34.43. (£35.135 * 0.98) So adding £27.75 to £34.43 gives us £62.18. Then finally deduct our back stake at Stan James, we are left with a profit of £12.18. I hope this article has given you an insight to how you can make money each way matched betting. This way of matched betting is more complicated than your typical initial signup offer but it shows you that you can make money from matched betting long after you have exhausted all the free bets offers that are out there. I really like the each way matcher by Oddsmonkey for this reason, there are no free bets required and thus it can also work on accounts that have free bets restricted as it doesn’t rely on them. Have a read of my Oddsmonkey review and Smarkets review today! If you would like to read more about each way arbing, then this matched betting blog has some excellent articles in the matched betting niche. There is a subscribe button on the right sidebar if you wish sign up for updates.